The world number three Hockeyroos suffered their second defeat to world number one, the Netherlands, after going down 4-1 in their final match of the TPG International Tri-Series Saturday night. Looking to redeem themselves after a previous 2-0 defeat to the Netherlands earlier in the week, the Hockeyroos’ defence managed to hold out their world class strikers during the first 15 minutes of play. It was at the 21st minute mark that the Dutch created themselves a valuable opportunity. Awarded a penalty corner, captain Maartje Paumen successfully hit target, a powerful shot that Australian goalkeeper Rachael Lynch couldn’t deny. Australian forward Emily Smith’s on-target field goal in the 47th minute deadlocked the result 1-1, giving the Hockeyroos a chance to be on par with the Olympic and world champions, however, the result was quickly broken when Naomi Van As found the back of the net following one minute later. Five minutes before the final siren, the Netherlands continued to push out the lead. Kelly Jonker and Naomi Van As’ strikes, two minutes apart, awarded the Netherlands a hard-fought 4-1 victory. Hockeyroos Head Coach Adam Commens was pleased with the improvement his side showed over the four match series. The Hockeyroos will now look towards the Great Britain Series in Bunbury and Perth next month, where they will meet world number six Great Britain across six competitive matches. The Hockeyroos will depart Singapore on Monday 25 February and are expected to arrive into Perth later that afternoon. Tickets are now on sale for the Great Britain Series via Ticketmaster Australia. As the Green Machine’s warm weather series draws to a close they faced a notable step up in opposition in the form of world number 5 Belgium. Fitzgerald was called into action to make an early save from a well-worked PC routine but it was on the 5 minute mark that the Belgians took the lead via a powerful reverse shot by Thys, 1-0. 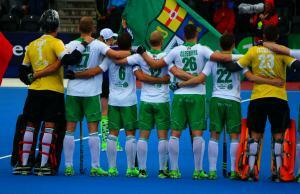 Ireland didn’t let the early goal unsettle them and had a series of long corners as the quarter drew to a close. 2 minutes into the second quarter Loughrey made it 1-1 as he tipped in a John Jackson cross after a terrific drive along the baseline. The tempo and speed of the game was nothing short of tournament-hockey, and Belgium scored a breakaway goal from an interception on the half-way line leading to a tap in at the back post, 2-1. 4 minutes later Belgium had increased the pressure and Dockier, showing his skill, created space for himself and fired home on the reverse, 3-1. Shimmins added his name to the score sheet in the opening minutes of the second half as a route one ball into the circle deflected up off a Belgian foot, Shimmins was first to react and showed great composure to smash it past the oncoming goal-keeper, 3-2 to Belgium. The Belgians appeared to go up another gear and two goals in quick succession made it 5-2. Their fourth goal coming via an interception in the Irish 25 and their fifth thanks to a clever penalty corner routine. Good phases of hockey for the Green Machine went unrewarded and a PC won by Caruth was well saved. Another speedy counter by Belgium saw great interplay at the top of the circle and a simple tap in to make it 6-2. Determination didn’t waver though and Stephen Cole did well to rob the ball and set Cargo up but his stinging reverse shot couldn’t sneak in the right side of the post. The Green Machine remained steadfast for the remainder of the game, defending two more penalty corners, and the match finished 6-2 to the world number 5. Hat-trick hero Hannah Martin celebrates netting against Wales. A hat-trick from University of Birmingham’s Hannah Martin inspired England to their first win of the EuroHockey Indoor Championships II with a 9-1 demolition of Wales. Martin struck three times in eight second-half minutes with England leading 5-1 as they showed yet more improvement in their third match of the competition. Grace Balsdon had continued her outstanding form in front of goal, netting two early penalty corners in the seventh and ninth minutes, to add to her two goals in the opening two games. Susie Gilbert added to the tally with her first of the competition and although Julie Whiting pulled one back for Wales, England were firmly in the ascendancy at the break. If the first half had been controlled by Andy Halliday’s side, the completely dominated the second period. Lucy Wood struck two goals in two minutes shortly after the interval before Martin took centre stage. The talented No5 scored in the 28th, 31st and 36th minutes to take England out of reach of Wales. Surbiton’s Sarah Haycroft put the gloss on the scoreline with a ninth just a minute from time. Giselle Ansley celebrates her goal with Susie Gilbert and Lucy Wood. Goals from Giselle Ansley, Grace Balsdon and Lucy Wood handed England a superb 3-2 win over Croatia in a nail-biting encounter at the EuroHockey Indoor Championships II. Andy Halliday’s side fell behind twice but showed great discipline, sticking to their gameplan to edge themselves ahead of Croatia with some brilliantly taken goals. A highly charged match got off to the worst possible start for Halliday’s side as Anamarija Somin gave Croatia a first-minute lead from a penalty corner. Undeterred, Giselle Ansley levelled the scores, ripping a bullet penalty corner past the goalkeeper in the 17th minute. Marina Abramovic restored Croatia’s lead three minutes later to send them in at the break ahead. England had their share of chances to get themselves back on terms but they could not find a way through, whilst at the other end Amy Tennant, a half time replacement in goal for Sabbie Heesh showed good reflexes to keep Croatia at bay. England remained patient, probing and keeping possession as they hunted for the equaliser. Their patience paid off in the 32nd minute as Grace Balsdon, the team’s top scorer tied the game up with an open play goal, her fifth of the competition. With Croatia reeling, England capitalised and Holcombe’s Lucy Wood got their noses in front with a well-taken finish two minutes after Balsdon’s leveller. Croatia threw everything at Halliday’s side in the closing stages but a mature, calm and disciplined defensive display ensured they held on for a superb win. England round off their EuroHockey Indoor Championships II campaign against Scotland tomorrow, at 9am UK time. Scotland Senior Women are fighting for survival in the EuroHockey Indoor Nations Championship II after the conclusion of the competition's second day. A second minute Dolores Peranic goal was enough to consign the Scots to a 1-0 defeat against Croatia in their final pool match this morning. More significantly, the loss consigned the national side to the relegation pool alongside the Balkan state, England and Wales. Having carried no points from the first stage of the tournament, the match against Wales this afternoon was labelled 'must win'. Thankfully, a prolific first half in front of goal yielded four goals without reply. Captain Vikki Bunce dispatched a penalty stroke in the third minute, followed by two penalty corner strikes from Amy Costello. A Charlotte Watson goal from open play a minute from the end of the first period rounded off a dominant display from the Scots. A second goal for Bunce shortly after the re-start made it 5-0, and Katie Robertson notched a sixth Scottish goal in the 28th minute. Nevertheless, Wales responded to adversity with a three goal burst inside three minutes; Katrin Budd, Abigail Welsford and Joanne Westwood scoring in quick succession. But the Scots saw the remainder of the match out to secure a vital three points with a 6-3 win. With England beating Croatia in the proceeding pool match, Scotland find themselves locked on three points with the Croats. Three points for Scotland against England tomorrow morning puts pressure on Croatia to better a Scottish winning margin by more than two goals against Wales. However, anything less than a win will reduce the squad to a nail-biting seat on the sidelines to await the outcome of Croatia v Wales. Lucknow: Delhi Waveriders continued with their winning run defeating Uttar Pradesh Wizards 3-1 in the sixth match of the 4th Coal India Hockey India League today. Delhi with their second win in a row now move to the top of the points table with 10 points. The match which was played at the Major Dhyan Chand Stadium, Lucknow saw the home team losing their second match in a row. Uttar Pradesh Wizards have so far won only one game in the three matches they have played so far. The first two quarters of the match saw the hosts taking control of the game with a lot of circle penetrations into the Delhi Waveriders side, but the visitor’s strong defensive line denied Uttar Pradesh Wizards from scoring. The hosts had an upper hand with a higher ball possession but some beautiful saves from the Delhi Waveriders goalkeeper ensured that both the teams move into the remaining two quarters with the score board reading 0-0. The third quarter began with Uttar Pradesh Wizards trying hard to score, but the visitors flawless defence ensured the home team’s efforts were not rewarded. Delhi Waveriders started pressing hard also on the counter and were rewarded with a penalty corner in 42nd minute. Rupinder Pal Singh of the Delhi Waveriders made no mistake thereafter to give the visitors a much desired lead of 1-0 in the game. Delhi continued with their attack thereafter but the hosts denied them from scoring till the end of the third quarter. The fourth quarter began with the Delhi Waveriders pressing hard from the first minute to extend their lead. Their efforts could not yield results for a while but an exceptional move from Delhi in the 59th minute saw the visitors extending their lead to 3-0 in the 59thminute through Steven Edwards, leaving the home team with a mammoth task to save them from a defeat. Uttar Pradesh Wizards desperate to score pressed harder on the counter and scored through a penalty corner in the very next minute through Argentine Gonzalo Peillat to reduce the gap to 3-1 but could not do much there after losing their second consecutive game today. Hero Emerging Player of the Match award of INR 25,000 - Mandeep Singh. The next match of the 4th Coal India Hockey India League will played between the Jaypee Punjab Warriors and Dabang Mumbai at the Sector 42 Hockey Stadium, Chandigarh on 24th January, 2016. Delhi Waveriders stuck to its plan and earned its second consecutive away win here on Saturday to be the only undefeated team in the fourth edition of the Hockey India League so far and go on top of the table with 10 points. Delhi beat Uttar Pradesh Wizards 3-1 against the run of the play. The host dominated a large part of the game, but paid the price for a weak and wayward forward line — Australians Jamie Dwyer and Eddie Ockenden had a good game as feeders, but the strikers’ attempts were weak and the Delhi defence rock solid. Akashdeep Singh conceded several turnovers, Tobias Hauke was off-target and Ramandeep Singh invisible on field. Some outstanding defence by Rupinder Pal Singh, Surender Kumar and Vickram Kanth not only defied a constant wave of attacks from UP, but also tackled brilliantly to only concede one penalty corner, in the final minute, that saw Gonzalo Peillat score to ensure one point for his team. UPW skipper V.R. Raghunath combined with Vikas Pillay to orchestrate his team’s chances. Kenneth Bain started the glut, finding the post in the third minute. Akashdeep Singh did the same a few minutes later and then Bain, put through by Agustin Mazzilli, sent a weak shot parried easily by DWR goalkeeper Devon Manchester. The visitor’s first real chance came in the 30th minute, but Raghunath managed to clear the danger despite at least eight players crowding the goal. The deadlock was broken in the 42nd minute when Rupinder made no mistake with Delhi’s first penalty corner. Peillat pulled one back for UPW but it was not enough. The result: Delhi Waveriders 3 (Rupinder Pal Singh-pen, Steven Edwards FG) bt Uttar Pradesh Wizards 1 (Gonzalo Peillat-pen). LUCKNOW: This was the second consecutive home defeat for the hosts at the Dhyanchand stadium, having lost to Ranchi Rays on Friday. For the Delhi team this was the second consecutive win having earlier defeated Punjab Warriors. The Wizards now have seven points from three HIL games, while the Waveriders have 10 points from two. In a game where the visitors kept a check on the much-heralded forwardline led by Tobias Hauke and Akashdeep Singh, the Wizards failed to find space in the rival circle. After a listless opening two quarters, Rupinder Pal Singh opened the account for the Waveriders with a sizzling drag off the first penalty corner of the match in the 42nd minute. And then, Steven Edwards got a field goal in the 59th minute to make it 3-0 for the visitors. The New Zealander pushed the ball past a sprawling Sree jesh after receiving a pass from the left by Talwinder Singh. With the new rule of a field goal being counted as two, the Wizards looked set to lose a point as the three goal defeat margin would have meant a blank on the points table. But, Argentine short corner specialist Gonzalo Peillat saved them that ignominy when he pushed hard and true off the only short corner the side earned in the very last minute of the game. The game didn't warm up much till the half-time as both the teams adopted safety first tactics. Though there were some individual forays, none of them tested the defence of either team. The goalkeepers of both the teams - PR Sreejesh of Wizards and Devon Manchester of the Waveriders - didn't have much work to do in the opening two quarters. Later, Sreejesh came up with some smart saves, but couldn't save his side from hurtling to another home defeat. Delhi's coach Cedric D'Souza later said that his side played well to their plan. "I am happy with their performance, though there is more room for improvement," he said. LUCKNOW: Delhi Waveriders maintained their winning streak and defeated Uttar Pradesh Wizards 3-1 to move to the top of the points table of the fourth Hockey India League on Saturday. Both the teams found it difficult to create enough scoring opportunities in the first half. After a barren opening half, the Waveriders finally broke the deadlock in the 42nd minute when tall Rupinder Pal Singh brilliantly converted their first penalty corner past an ever-alert PR Sreejesh in front of UP Wizards goal. Kiwi Steven Edwards (59th) then scored a field goal in the penultimate minute of the match to extend the Waveriders lead to 3-0 as per the scoring system one field strike is counted as two. UP Wizards pulled one back in the final minute with a powerful penalty corner conversion by Argentine Gonzalo Peillat. By virtue of this win, the Waveriders have moved to the top with 10 points from two games. The Delhi outfit had earlier defeated Jaypee Punjab Warriors 5-4 in their tournament opener. UP Wizards are placed second with seven points from three games. UP Wizards will next host Kalinga Lancers on January 25 while the Waveriders will travel to Ranchi to play defending champions Ranchi Rays on January 26. LAST season's double silver medallists UniKL Young Guns received a massive blow when they were beaten 1-0 by Politeknik in Division one of the Junior Hockey League Saturday. UniKL wasted 12 penalty corners, one penalty stroke and had a goal disallowed in the drama-filled match before bowing out in this disastrous outing. The toast of Politeknik was Fakhri Ardillah who scored the winner in the 47th minute off a field attempt. Politeknik moved to third on the standings on seven points, while UniKL slid down to an all-time low sixth. "It was a disastrous outing as we wasted so many chances which included 12 penalty corners and a penalty stroke. This is a disaster of our own doing which had placed us in an all-time low over many seasons," said UniKL coach I. Vickneswaran. Double champions SSTMI Thunderbolts continued their path towards another League title when they beat Nur Insafi 4-1 to remain unbeaten after four matches to top the Division. "We have one week to train and claw back into the picture as we need to finish among the top-four to play in the knock-out stage. The players have themselves to blame as they somany chances to win the match but just could not score. Hopefully they wake up next weekend," said Vickneswaran. In the other match, Nur Insafi scored the first goal in the third minute off Azril Shaqeer but SSTMI Thunderbolts fought back with goals from by Aliff Syazwan (eighth), Akhimullah Anuar Essok (52nd, 56th) and Amirul Hamizan Azahar (65th). RESULTS: Division One: SMKDBL Young Guns 4 Olak Tigers 5, Politeknik 1 UniKL Young Guns 0, SSTMI Thunderbolts 4 Nur Insafi 1. Division Two: Group A: Matri 7 MCKK 2, MS Kedah 3 SM Sains Azlan Shah 0, Penang USM 1 Perlis Young Lions Juniors 4. Group B: MSSWPKL 4 MSNPK-ILHC 0, Anderson PHA 6 STAR 2. Group C: TBSS Tampin 5 Sabah Sports School 4, Young Hurricanes Malacca 4 SM Sains Johor 1, Malacca High School 2 SMKDBL Juniors 1. KUALA LUMPUR: Tunku Mahkota Ismail Sports School (SSTMI)-Thunderbolt earned the wrath of coach Wan Roslan Wan Abdul Rahman despite a win in the TNB-Malaysian Junior Hockey League. The reigning double champions came from behind to beat Nur Insafi 4-1 for their fourth straight win at the SSTMI pitch in Johor Baru to surge to the top of the Division One standings. “We were supposed to register a big victory. The Pahang Sports School hammered Nur Insafi 11-1 last week. My players let me down as they did not make full use of the chances,” said Wan Roslan. Nur Insafi shocked four-time double champions SSTMI by taking the lead after only three minutes through Muhammad Nazran Zamri’s field goal. But Mohammad Aliff Syazwan Noorshah drew level five minutes later off a penalty corner. SSTMI then came alive in the second-half to score three goals through Mohd Akhimullah Essok (52nd and 56th minutes) and Muhammad Amirul Hamizan Azahar (65th). In another match, Universiti Kuala Lumpur (UniKL) suffered another embarrassing defeat. UniKL, last year’s league runners-up, were beaten 1-0 by Politeknik Malaysia at the Taman Daya Stadium in Johor Baru. Muhammad Fakhri Ardillah Saifullah starred for Politeknik Malaysia, scoring a field goal in the 47th minute. PESHAWAR: National senior team would visit Australia in November this year, secretary of the Pakistan Hockey Federation (PHF) Shahbaz Ahmed Senior said on Saturday. According to Shahbaz, the PHF was striving to give maximum possible international exposure to both senior and junior teams and in this regard, he added, “we want the junior team should get proper exposure well before the Junior World Cup” to be hosted by India in December this year. Commenting on the senior team’s proposed visit to Australia, the PHF official appreciated the support offered by Hockey Australia which has promised to provide free boarding and lodging facilities to the Pakistan squad on the tour Down Under. On the financial side, the PHF secretary stated the federation was ready to give full details of its matters to to the government, acknowledging it was right to get these matters checked by the government. He lamented that lack of funds didn’t allow the PHF to send its team on foreign tours. “[However], now the situation will soon improve as far as international exposure to the junior and senior teams is concerned,” Shahbaz added. Meanwhile, shedding light on the efforts to restore international in Pakistan Shahbaz said efforts were being made to invite teams like China, Malaysia to play Test matches in Pakistan. In this regard, he added, PHF president retired Brig Khalid Khokhar had been working tirelessly . “The PHF president has held several meetings with members of the AHF and the FIH and all of them want to support Pakistan hockey,” Shahbaz concluded. England Hockey are deeply saddened to report that Tony Moffatt, an absolute stalwart in hockey for Kingston-upon-Hull, Yorkshire, the North and England Hockey over many years, died peacefully at 5.30 a.m. on Friday 22 January after suffering a severe stroke last week. "His commitment to hockey at so many levels was incredible and the role he played as Chair of the Regions Consultative Committee and as their representative on the Board of England Hockey was was first class. He will be sorely missed by all that knew him, volunteered with him and worked with him."